Light therapy has been used in dermatologists' offices for years as a treatment for acne, but it's only recently started to find its way into our homes. And though the treatment sounds like science fiction, it works: blue and red light can penetrate the skin to attack acne-causing bacteria and reduce inflammation. From face masks to targeted light wands, anyone concerned about breakouts has a host of new options for treating them without an expensive visit to an aesthetician. 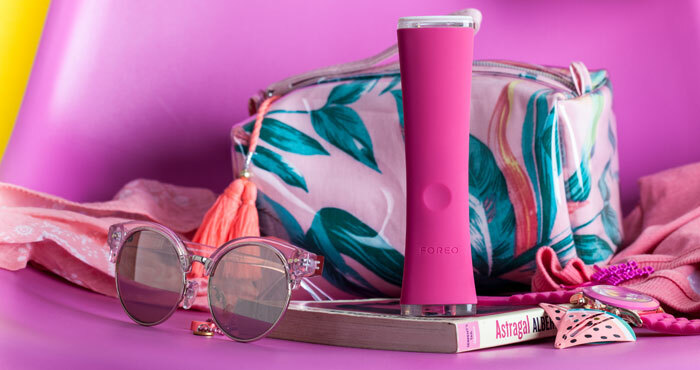 The latest product to offer light as an acne cure-all is the Foreo Espada, which attacks acne with blue light to kill bacteria and vibration to stimulate circulation. This combination makes the Espada a solid treatment for mild to moderate acne, including whiteheads, blackheads and ordinary pimples. And before you start worrying about spending money on another useless beauty product, the Foreo Espada is FDA approved, with clinical studies that say users can see results in as little as one treatment, with 90% of users seeing healthier skin after using Espada for just one month. And while there's no study that can tell you whether a particular treatment will cure your acne, light treatment can be a good addition to your routine if you have stubborn acne other products aren't clearing up completely. Using the Espada is simple. Just press the gadget against clean skin where a pimple is starting to form: the Espada will shine blue light and emit T-Sonic pulsations. After 30 seconds, the treatment is done and the device automatically shuts itself off. You can repeat the treatment up to four times on a single spot for particularly bad blemishes or move on to your next blemish and start over. This is perhaps the gadget's biggest flaw: treating your entire face in 30-second blocks takes time. That much time can be hard to find in the hectic pace of our everyday lives, and after a few of those 30-second sessions, you may be wondering whether a trip to the dermatologist's office — where they typically treat your entire face at once — would be worth the cost. However, if you only have a few problem spots, being able to target them specifically may be perfect for your routine. Foreo Espada retails for $149, which sounds pricey until you consider that a single visit to your dermatologist could cost you just as much. Cheaper options like Neutrogena's $35 Light Therapy Acne Mask may sound appealing, but remember to consider the total cost: the Neutrogena mask requires a new "activator" every 30 days at $15 each. That means a year of using the seemingly budget-friendly Neutrogena will cost $200 — where the Foreo Espada only needs to be cleaned regularly and charged every 240 uses. You can buy the Foreo Espada now for $149 from Amazon.